A Pessimist Presupposes Failure. An Optimist Presupposes Success. A pessimist sees a dead end. An optimist sees an unpaved road. A pessimist is an expert. An optimist is a novice. A pessimist muddies the present with the past. An optimist clarifies the present with the future. A pessimist believes that ideas are rigid. An optimist believes that ideas are pliable. A pessimist lives in a world that is limited. An optimist lives in a world of possibility. A pessimist worries about problems. An optimist focuses on solutions. A pessimist expires. 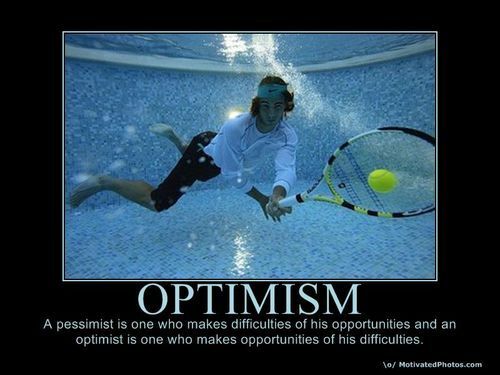 An optimist inspires. A pessimist quits because they’re stubborn. An optimist is too stubborn to quit. Steve Jobs, the Wright Brothers, Walt Disney -> Optimists. People you’ve never heard of -> Pessimists.